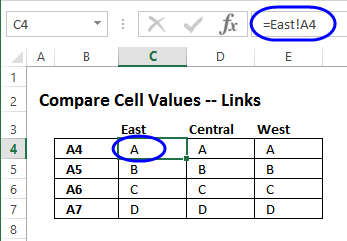 Use the Excel INDIRECT function to compare cell values, and combine it with the FORMULATEXT function to compare formulas on multiple sheets. Thank you to Rudy from Minneapolis, for sending his example of this technique. In this example, there are 3 sheets with regional data -- East, Central and West. 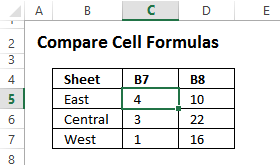 All 3 sheets have the same structure, with totals in cell B8. 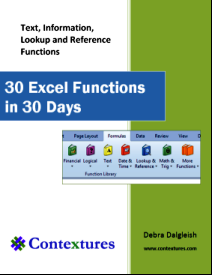 If a workbook has multiple sheets with identical structures, you can use links, and 3-D formulas, to create sums from all the sheets. When doing this, it is important that the structures do not change on the individual sheets, in order to keep the totals accurate. In this tutorial, you'll see how to create a 3-D formula, and set up a verification table, to check that the cell values and formulas are identical on all three sheets. 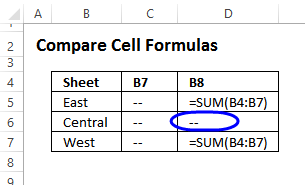 On the Summary sheet, there is a 3-D formula in cell C6, that calculates the sum of the values in cell B8, on all three sheets. Press the Shift key, and click on the tab for the West sheet -- this selects those two sheets, and any sheets between them. A simple way to check the cells on multiple sheets is to link to those cells, from a verification sheet. However, this can give the false impression that everything is okay, even if the structure on one or more sheets have changed. To see an example of this problem, links to the 3 sheets have been set up on the CheckValuesLink sheet. The values are the same for each sheet, so everything looks okay. Then, insert a blank row on the Central sheet, above row 6. The total is shifted down to row 9. 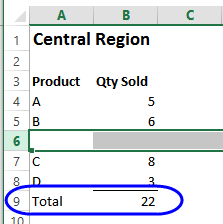 On the Summary sheet, the Region Total is now incorrect -- it shows 29 instead of 48 -- because the Central total is not included. Creating links to the Region sheets was quick and easy, but is not a reliable method for verifying that the sheet structures have not been changed. 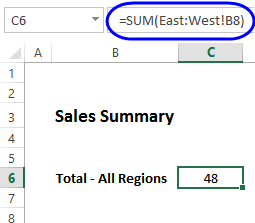 Instead of using simple links to the Region sheets, the INDIRECT function can be used to create a static link to a specific sheet and cell. 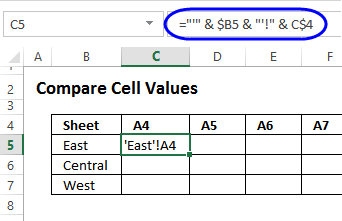 The reference to cell $B5 has the column locked ($B), so it will not change when the formula is copied across the row. The reference to cell C$4 has the row locked ($4), so it will not change when the formula is copied down the column. Next, revise the text string formula, to wrap it with the INDIRECT function. This will create a reference to cell A4 on the East sheet. 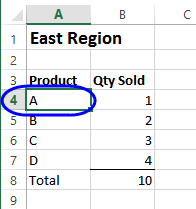 To confirm that the result is correct, check cell A4 on the East sheet. That cell contains "A", which matches the result of the formula in cell C5. The values from cells A4:A7 on all 3 region sheets are now visible, and can be easily compared for structural changes. In the screen shot below, all the regions have the same values in each cell, so the structures are identical. Insert a blank row on the Central sheet, above row 6. Check the grid, and it shows that the Central values are different from the other sheets. Delete the blank row that was inserted on the Central sheet, above row 6. Check the grid, and it shows that the Central values are now the same as the other sheets. 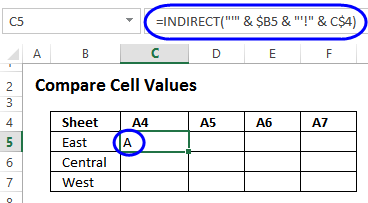 In addition to checking cell values, the INDIRECT function can be combined with the FORMULATEXT function, to check the formula in a specific sheet and cell. 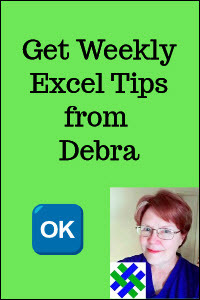 This technique is best for checking a small number of key cells, because both the INDIRECT and FORMULATEXT functions are volatile, and could slow down the workbook calculation, if used in a large number of cells. Now, the grid shows the values from cells B7 and B8 on each region's sheet. 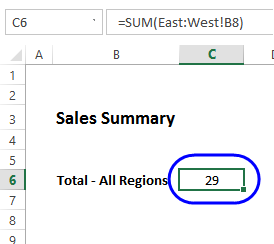 To show the cell formulas, instead of values, revise the formula, to wrap it with the FORMULATEXT function. 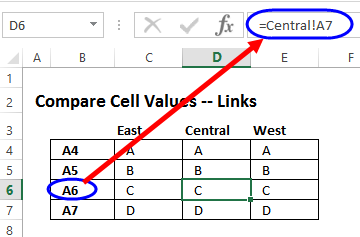 If the referenced cell does not contain a formula, the result will be #N/A, as in cell C5, below. 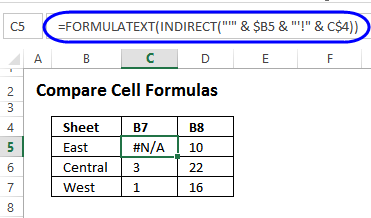 Now, if the referenced cell does not contain a formula, the FORMULATEXT result will be #N/A, and the IFERROR result is 2 hyphens, as in cell C5, below. The formulas from cells B7:B8 on all 3 region sheets are now visible, and can be easily compared for structural changes. 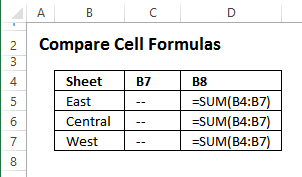 In the screen shot below, all the regions have the same formulas in each cell, so the structures are identical. Check the grid, and it shows that the Central formulas are different from the other sheets. Check the grid, and it shows that the Central formulas are now the same as the other sheets. To see how the INDIRECT and FORMULATEXT functions work to check values and formulas, download the SheetCompare sample workbook. The zipped file is in xlsx format, and does not contain macros. The CheckFalues and CheckFormulas sheets have conditional formatting added, to highlight any differences in the sheet structures. 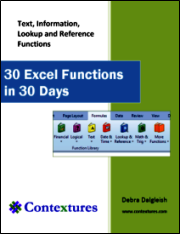 NOTE: The FORMULATEXT function is available in Excel 2013 and later.